ArtNr. : RME 6808 Pro S.T. 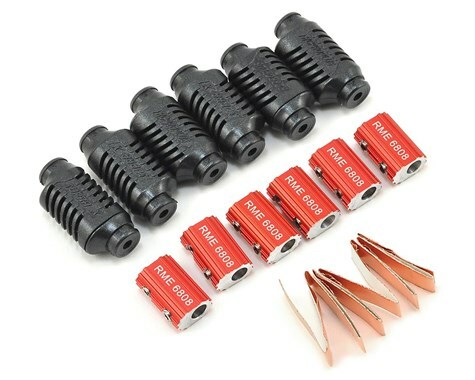 RCProPlus has continued to push the connection industry to the limits by providing incredibly high quality, forward thinking, and unique connection designs for all types of RC applications. RME 6808 Pro S.T. continues to check off all of these boxes by utilizing a non soldered motor connection! RME 6808 Pro S.T. Includes copper tape which is wrapped around bare wire, inserted into a unique aluminum allow housing that features an incredibly low impedance level, and finally a sleek plastic protective housing that RCProPlus is known for. The RME 6808 Pro S.T. connections reduce both motor and operating temperatures due to the incredibly low impedance design.